A spin-off from ‘Breaking Point’, this novella tells the story of Bill as he and his family are caught up in one of the worst fires to rage across the Blue Mountains in Australia. The novella was originally a (very long) chapter within Breaking Point, serving as another example of the chaos caused when the advanced weather warning system, DEWWs, fails. But alas, there were just too many characters thrown in, and the reader would have been drawn away from the main heroes of the story for too long. 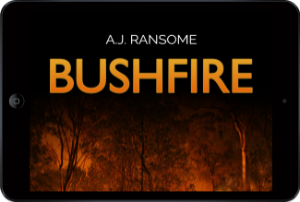 I realised that the bushfire chapter, with a little tweaking, could stand as a story in its own right. Thus, ‘Bushfire’ was created; a free taster for readers. I’m confident that if you enjoy reading Bushfire, you’ll certainly like ‘Breaking Point’, now released on Amazon.